Dialogs in OS X El Capitan are special windows that pop up over the active window. You generally see them when you select a menu item that ends in an ellipsis ( . . . ). 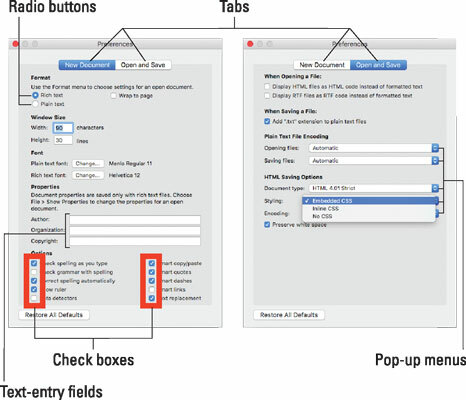 Dialogs can contain a number of standard Macintosh features (dealie-boppers), such as radio buttons, pop-up menus, tabs, text entry fields, and check boxes. You see these features again and again in dialogs. Take a moment to look at each of these dealie-boppers here. This window offers most dealie-boppers you’re ever likely to encounter. Radio buttons: Radio buttons are so named because, like the buttons on your car radio (if you have a very old car), only one at a time can be active. (When they’re active, they appear to be pushed in, just like the old radio buttons.) Radio buttons always appear in a group of two or more; when you select one, all the others are automatically deselected. Here’s a nifty and undocumented shortcut: You can usually select check boxes and radio buttons by clicking their names (instead of the buttons or boxes). Tabs: When a dialog contains more information than can fit in a single window, the info may be divided among panes denoted by tabs. In the figure, the New Document tab is selected on the left, and the Open and Save tab is selected on the right. Pop-up menus: These menus are appropriately named because that’s what they do: They pop up when you click them. In the figure, the Styling menu has been clicked and is popped up; the other pop-up menus — Opening Files, Saving Files, Document Type, and Encoding (mostly obscured by the popped-up Styling menu) — are unclicked and unpopped. You can always recognize a pop-up menu because it appears in a slightly rounded rectangle and has a double-ended arrow symbol (or a pair of triangles, if you like) on the right. Text-entry fields: In text entry fields, you type text (including numbers) from the keyboard. In the figure, the Width, Height, Author, Organization, and Copyright options are text-entry fields. Check boxes: The last dealie-bopper that you see frequently is the check box. In a group of check boxes, you can select as many options as you like. Check boxes are selected when they contain a check mark, and they’re deselected when they’re empty, as shown. Another dealie-bopper you should become familiar with is the disclosure triangle. If you see a triangle in a dialog box or sheet, try clicking it. If it’s a disclosure triangle, it will reveal additional options (or its contents if it’s a folder in the Finder’s List view). Some applications have tri-state check boxes (not talking geography here). These special check boxes are empty when nothing in the group is selected, sport an X when everything in the group is selected, and sport a minus sign (–) when some items in the group are selected and some are not.